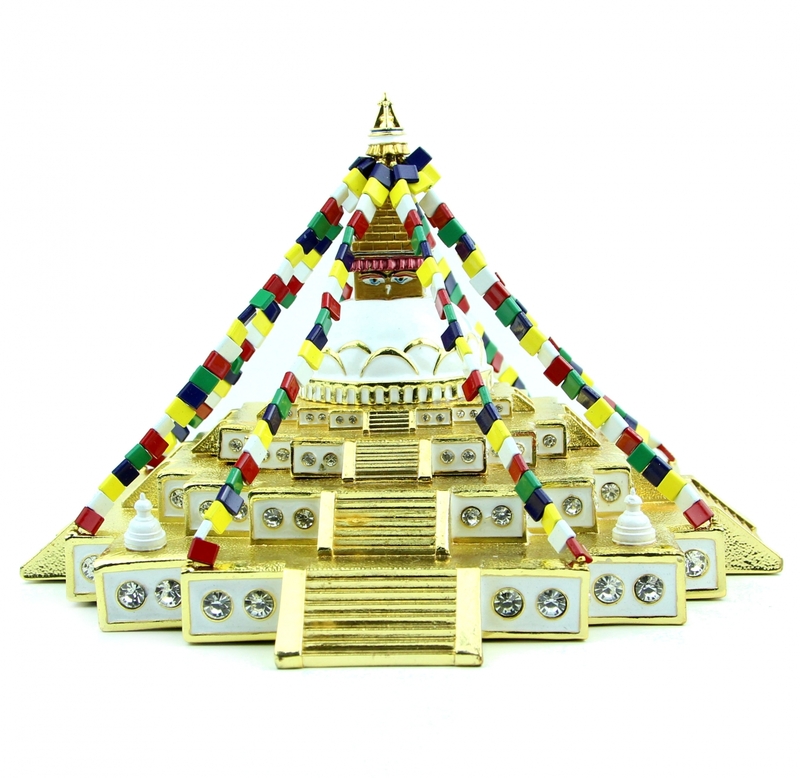 This beautiful propitious bejeweled Boudhanath Stupa is able to protect one against harm brought by violence and aggression. It mollifies conflicts, minimizing the harm. Those powerful mantras can bring one auspicious blessing against uncalled for disaster and lead towards ultimate happiness and good fortune. The Boudhanath stupa, located about 6.8 mi from the center and northeastern outskirts of Kathmandu, is one of the largest stupas in the world. The Boudhanath Stupa has taken as a beacon of Buddhist belief as a giant mandala of peace and beauty and also giant eyes. Stupa is also called SheliTa which look like the pagoda in which to hole Sheli. Sheli is the relic of the Buddhist patriarch Sakyamuni Buddha bone, bead-like or gem-like resultant. Buddhism revere the relic to worship the Sakyamuni Buddha. Buddha relic is handed down as the sacred Buddhist. The dimension of the feng shui bejeweled Boudhanath Stupa is approx. 8.25" x 8.25" x 5.5". It is made of brass and embedded a lot of beautiful crystals. Sheli is not included.